There’s some truth to this, but it falls short. Let’s look at what Scripture has to say, and not just one verse, but let’s look at a couple of verses. One, of course, would be one the very first times apparently that Jesus even mentioned this subject, broached this subject in the Sermon on the Mount. Jesus said, I’m reading from Matthew 5, verse 31, “It was said.” Now, notice he didn’t say Scripture says or God says. This is an accurate quote, “It was said, whoever sends his wife away let him give her a certificate of divorce.” I submit to you it never says that anywhere in Scripture, and I challenge anyone, show me where it says that in the Old Covenant. Jesus is not quoting what the Old Covenant says, what the Mosaic Law says. 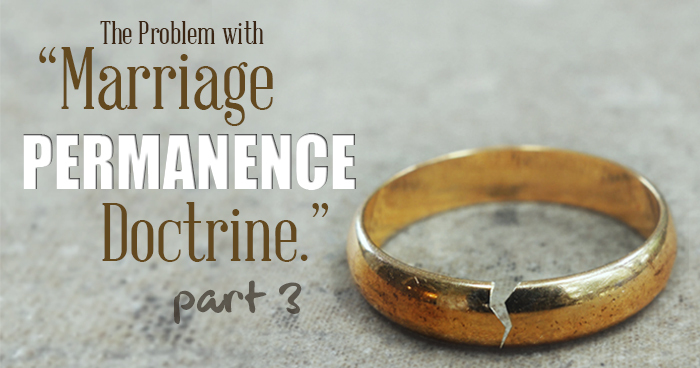 He’s quoting what the Scribes and Pharisees are teaching about divorce. In other words, the main thing is if you send your wife away make sure you give her that certificate. That’s what they harp on, but you can divorce for any cause. Jesus says now, here’s His counterpoint to the Pharisaical teaching of his day, “but I say to you that everyone who divorces his wife,” there’s one clause that’s put in here as exception, “except for the reason of unchastity makes her commit adultery. Whoever marries a divorced woman commits adultery.” Okay. Now, again you can see that Jesus is not going to contradict what the law of Moses says for goodness sake. He’s the Author of the law of Moses, He’s ministering to people who are under the law of Moses. If the New Covenant changed things, the New Covenant hasn’t started. It’s not going to start for about three years yet, and basically the fundamental premise that Jesus changed basic fundamental morality under the New Covenant is wrong anyways, but I don’t have time to go into that. Again Jesus is elaborating on the law, trying to bring clarification of what the law is really teaching. This is what He’s saying, essentially the law is teaching that in God’s eyes when a man divorces his wife, except in the case of unchastity, he makes her commit adultery. Then the man who marries his ex-wife, he’s committing adultery as well in God’s eyes. Of course other places, I think in Luke or Mark, it talks about how he commits adultery, when he gets remarried and so forth. Does that mean Jesus wants everyone who is divorced or remarried to divorce again? No, absolutely not! Because the basic premise of the marriage permanence folks is that you’re married to that original person until they die. That’s the permanence of marriage, that’s where they get that phrase, the permanence of marriage. Therefore the only remedy for your adultery is to divorce your current wife and if possible go back to your first husband. It’s his wife, they’re married, he writes a certificate of divorce, so that indicates now they’re divorced, at least legally divorced. He gives her that certificate and he sends her out. They’re done. “She leaves his house,” verse 2, “and goes and becomes another man’s wife.” Now she’s married a second time. Now by Jesus’s definition she’s now an adulteress in some sense because she made a lifelong covenant with the first husband. Now again, he divorced her, so she’s not to blame for the divorce. At least we can’t find any evidence for that. He divorced her, he gave her this certificate. She’s like the victim, but in one sense she’s an adulteress because she had a covenant with this guy. She leaves his house and goes and becomes another man’s wife. Oh my goodness, so they must not actually be married in God’s eyes. No, they’re not still married in God’s eyes because if she by remarrying committed adultery, that is what severs the covenant she had with her first husband. If God wasn’t recognizing it at the time of her divorce, if in God’s eyes she wasn’t actually divorced, when she remarried this other guy and consummated her marriage with him, now she’s an adulteress according to Jesus, right? In relationship to her first husband, that’s who she committed adultery against. That relationship now is severed by adultery. That’s why Jesus said whoever divorces his wife, except for the reason of unchastity makes her commit adultery. If in fact she has been unfaithful to him, and he divorces her because of her unfaithfulness, that’s a legitimate divorce. Why, because adultery is the breaking of the covenant, it severs and ends the relationship. Period. Okay, so when the marriage permanence folks say Jesus said whoever divorces and remarries commits adultery, and you’re continually committing adultery., it’s non-stop adultery, and the only way out of that is to divorce again… Oh contraire, mon soeur. When that second marriage was consummated, yes an element of adultery existed in that because of what transpired before. At that act, that in some sense adulterous act, that ended the covenant that existed with the first husband. That’s proven by not only in Deuteronomy Chapter 24, which forbids the twice married woman from going back to her first husband, but also by what Jesus said in the Sermon on the Mount. He made an exception for the man who illegitimately divorces his wife, there’s an exception to that rule if she’s been unfaithful. The covenant’s been severed, and there’s freedom to remarry. Okay, so maybe one more time we’ll look at this. I know I’m going to get all kinds of disagreement, but hey I’m doing my best. Okay thanks for joining me, hope to see you next time. God Bless.